← Can the “Maelstrom of the Lofoten Basin” swallow ships? Poleward heat transport as a function of latitude (black). The contributions by the atmosphere (red) and oceans (blue), are also shown . The Sun is Earth’s largest source of energy. In addition to being essential for plant and animal life, this energy is also behind almost all aspects of our weather and climate. Due to the fact that the Earth is approximately spherical, the Sun’s energy is not evenly distributed across the planet. Most of it arrives in the equatorial and tropical regions, and very little reaches the poles. This has one very obvious effect: it is much warmer at the equator than at the North or South Poles. In fact, the typical temperature difference between the Caribbean and Alaska is several tens of degrees. If, however, both the oceans and the air were immobile, with not even the slightest breeze or current, the same temperature difference would most likely be a three digit number. This is because both the atmosphere and oceans carry an extremely large amount of heat from the warm tropics to the cold poles. Here, extremely large means about 300,000 times the UK’s average electric power consumption! 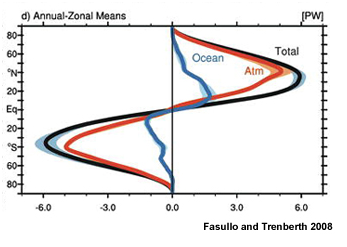 In the tropical regions, the ocean carries about half of this; outside of the tropics, the atmosphere accounts for the dominant share (see figure above). A first, very interesting aspect of heat transport by the atmosphere is that it is very erratic. On most days, very little heat is transported. On a few days every season, however, there are large bursts of heat which are carried to the Poles. To give an idea of how large these bursts are, at any point outside the tropics the atmosphere typically carries over half of the total heat for the season in just 5 days. A second interesting aspect is that these bursts generally happen in a few specific regions of the world, for example the North Atlantic . Seeing the magnitudes involved, it should come as no surprise that atmospheric heat transport has important effects on the two Polar Regions. Both are covered in ice, and one of the factors setting the amount of ice that melts every year is temperature, which in turn is largely determined by the heat carried by the atmosphere. The South Pole is by nature much colder than the North Pole, and most of the ice there sits on land and is very thick – up to several kilometres on a large part of the continent! Changes in the amount of heat carried by the atmosphere therefore have a reasonably limited effect on the ice cover, at least in the present climate. At the North Pole, on the other hand, there is a large area of year-round ice floating on the ocean. This ice is very thin – generally no more than a few metres – and the temperatures in the region are significantly higher than in its southern counterpart. If the atmosphere carries even a small amount of extra heat, it can lead to very large areas of sea-ice melt during the summer months . In the regions where most of the bursts of heat transport happen, a few extra ones per season could be sufficient to provide this additional heat. The consequent melting of the ice could then have major implications for the climate of Northern Europe and the circulation in the Atlantic Ocean. Currently, both the existence of heat transport bursts and the fact that larger than usual heat transport by the atmosphere can melt large areas of ice have been established in scientific publications. What is still missing is the demonstration of a direct link between the two; that is, that the larger than usual transport can be related to more frequent bursts in the specific region where the ice has melted. Due to the potentially major impacts of large-scale sea-ice melt, it is extremely important to study the link between larger than usual ice loss and heat transport bursts. Indeed, the latter might play an important role in affecting our present – and future – climate, and hence our everyday lives. Fasullo, J. T., Trenberth, K. E. (2008). The Annual Cycle of the Energy Budget. Part II: Meridional Structures and Poleward Transports. J. Climate, 21: 2313-2325. Messori, G., Czaja, A. (2013). On the sporadic nature of meridional heat transport by transient eddies. Q.J.R. Meteorol. Soc., 139: 999–1008. Graversen, R. G., Mauritsen, T., Drijfhout, S., Tjernström, M., & Mårtensson, S. (2011). Warm winds from the Pacific caused extensive Arctic sea-ice melt in summer 2007. Clim. Dyn., 36 (11-12): 2103-2112. I am Ph.D. student in the Physics Department at Imperial College London. My research interests focus on meridional heat transport in the atmosphere and its effects on the polar regions. This entry was posted in Air, Arctic, Climate, Future, Ice and tagged atmosphere, extreme events, heat transport, Sea-ice. Bookmark the permalink.